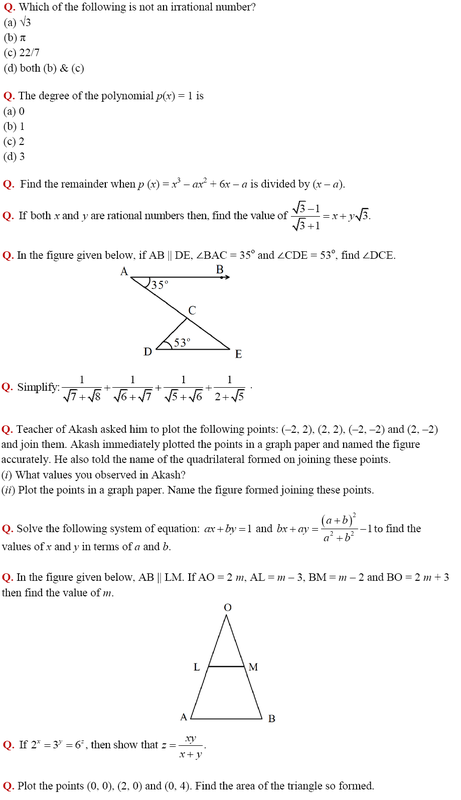 Find CBSE Class 9 Mathematics Practice Paper for the coming SA - I exam. This practice paper contains important questions based on concepts likely to be asked in the exam. With the help of questions in this practice paper, one can also analyse his or her preparation level for the coming exam. Jagranjosh presents CBSE Class 9th Mathematics Practice Paper for the coming SA I Mathematics Examination 2016 ‒ 2017. Some concepts in CBSE Class 9 Mathematics are very important from examination point of view. Questions based on specific concepts are frequently asked in various CBSE schools. Most of the questions in this practice paper are based on such important concepts.